Study reveals NFL’s most ‘unstable’ fan base — any guesses? An Emory University study has confirmed what many people have long purported: Football fans – and especially the ones rooting for the New England Patriots, Pittsburgh Steelers or Oakland Raiders — are an unstable group. Marketing professors Michael Lewis and Manish Tripathi devised an algorithm and analyzed data to try to figure out how various fan bases deal with losses, and their study found that fans of the Raiders, Steelers and Patriots do not cope well. Researchers turned to Twitter to track fan responses to games, using their algorithm to label tweets as positive or negative and then trace the swing of emotions, according to the Pittsburgh Post-Gazette. Some of the fan bases that responded the most negatively after losses were also the most positive after wins, giving them a high ranking on the study’s list of "unstable" franchises. For example, tweets from Steelers fans were 79.6 percent positive following wins in 2012, but just 33.1 percent of tweets were positive following a loss. That 46.5 percent gap made the Steelers the second most unstable fan base, following the Raiders’ 47 percent margin. In contrast, the gap for Dallas Cowboys fans was just 4.8 percent. That made them the most "stable" fans, followed by the Colts, Eagles, Texans and Falcons, who perhaps have reduced expectations. 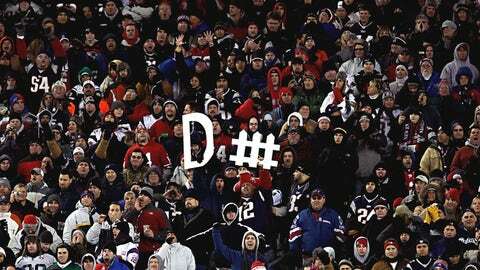 The Patriots ranked third on both the list of unstable fan bases and saddest fan bases after a loss. They did not make the happiest fan base list, which was led by the Saints (92.1 percent positive tweets after a win), Browns, Raiders, Seahawks and Bears.